What: It’s the 26th annual production of this classic holiday tale at the Alliance, which includes live music and an all-Atlanta cast. What: Are you a fan of the 1964 stop-motion TV special? (Let’s be honest: Who isn’t?) Start a new holiday tradition with this live version at the Center for Puppetry Arts, featuring puppets that are the spitting image of the Rankin/Bass originals. What: About 70 miles from Atlanta is one of the Southeast’s biggest holiday lights displays. Eight million bulbs make up more than a dozen scenes like Snowflake Valley, Santa’s Workshop, and Christmas Tree Lane. Drive through yourself, or hop aboard the festive Jolly Trolley for a carriage ride through the grounds. What: Throughout December, historic Roswell hosts a slate of holiday-themed events, from breakfast with Santa, to candy cane hunts and storytelling, to cookie and gingerbread decorating. What: Priscilla’s porcine express made its debut in 1953 in the toy department at Rich’s downtown. More than 50 years later, families can still hop aboard outside Macy’s at Lenox Square. A portion of the ticket sales goes to Children’s Healthcare of Atlanta. When: 4:30 p.m. to 10 p.m. (Monday through Thursday); 4:30 p.m. to 11 p.m. (Friday); 10 a.m. to 11 p.m. (Saturday); and 12 p.m. to 10 p.m. (Sunday). Plus extended hours on holiday and school breaks. What: This holiday season, an open-air ice-skating rink debuts in the midst of Marietta’s charming historic square. For extra cheer, stop by on December 3, when Santa will make an appearance prior to the lighting of the Christmas tree. Cost: Thursday through Sunday: $26 for adults ($21 for members); $20 for kids ages 3 to 12 ($15 for members); free for kids 2 and under. Monday through Wednesday: $23 for adults ($18 for members); $17 for kids ages 3 to 12 ($12 for members); free for kids 2 and under. What: For the fifth year, the midtown Garden is illuminated with more than two million lights. In addition to the crowd-pleasing botanical displays and interactive exhibits from previous seasons, you can stroll through the new nearly-100-foot-long Tunnel of Light. What: Still mourning the defunct Atlanta Festival of Trees? Find solace at Fernbank, where more than 30 trees and holiday displays, each representing a different country’s culture, are displayed throughout two floors of the museum. When: 10 a.m. to 7 p.m. Cost: $28 for adults and kids ages 3 and up; free for kids 2 and under. Parking additional. What: Hit the slopes without leaving town at Stone Mountain’s Snow Mountain, a man-made frosty playspace filled with tons of the white stuff for tubing, tobogganing, snowman-building, and more. What: Long before Frozen fever, there was the original Snow Queen story from Hans Christian Anderson. This 50-minute show is based on Anderson’s 1844 fairy tale. Bundle up—the play will take place in an open-air woodsy playground. What: Broadway actor Emerson Steele (2014’s Violet) plays the famous Shirley Temple role in this staging of Frances Hodgsen Burnett’s classic story. What: For decades, fans have flocked to St. Philip for annual holiday concert (now in its 35th year) by the Atlanta Gay Men’s Chorus. The program ranges from traditional carols to modern tunes, and—in another longstanding tradition—is followed by an ice-cream social. What: It’s time to dress up the family’s best friend in his holiday finest. One day a year, the Botanical Garden opens its doors to four-legged residents, who can compete in a holiday costume contest, enjoy refreshments in the Pup Tent, and even meet St. Nick. What: The largest holiday parade in the Southeast features marching bands, floats, and huge helium-filled balloons. The parade caps off with—you guessed it—an appearance from Santa. What: Together, Horizon Theatre Company and Atlanta Children’s Theatre Company present this one-hour production, a holiday adventure featuring twelve little girls in two straight lines. For kids 3 and up. What: Kids can bring their furry friends for a special afternoon filled with hot cocoa, tea sandwiches, and sweets. Plus: check out the Christmas-decked mansion, participate in holiday sing-a-longs, and even enjoy a visit from the big guy in red. What: This year marks the 20th anniversary of the Atlanta Ballet’s production at the Fox, and the last season for retiring artistic director John McFall. It’s also a chance for budding ballerinas to show off their moves. 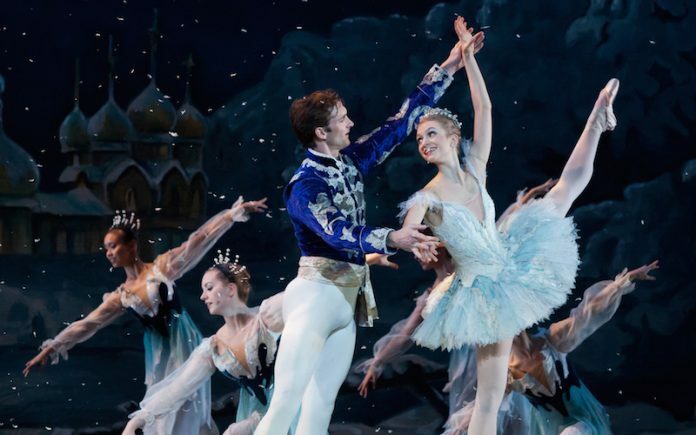 Every year, the show features 80 students from the Ballet’s Center for Dance Education. What: After closing in August for an $8 million renovation, the Children’s Museum reopens with play-based, hands-on educational exhibits. Your child can “dig up” archeological artifacts, build a rocket, go to work on a farm, and more. What: For the child to whom princess equals A-list celeb on par with Santa himself. Disney standbys Mickey, Minnie, Donald and Goofy are on hand to bring the stories of Cinderella, Belle, and Snow White to life. What: Get into nature’s holiday spirit with this 5th annual festival, where kids can meet live reindeer, hike the CNC trails, participate in winter crafts and games, and roast marshmallows. What: For pop-obsessed teens on the nice list, this concert from Power 96.1 features a roster of Top 40 talent, from Nick Jonas to Justin Bieber to Hailee Steinfeld. What: This afternoon performance will be a 75-minute, family-friendly affair, with all your favorite classic holiday tunes. Featuring artist-in-residence vocalist Morris Robinson, the All City High-School Chorus, and perhaps even a pop-in from Santa himself. What: Little ones can ring in 2016 at noon rather than midnight with this early-bedtime-friendly event at Fernbank. The party atmosphere includes a kids’ DJ, New Year’s countdown, and balloon drop.